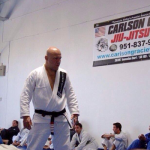 LAHAINA — In a relatively short span of time, the Carlson Gracie 808 Jiu-Jitsu club headed up by Christian Grandi has made a remarkable impact in several important ways. 808 Jiu-Jitsu is closing in on two years here on the West Side, and six months ago opened up their state-of-the-art facility at the Emerald Plaza industrial complex. Since then, Grandi Sensei reported, the club register has grown to upwards of 40 practitioners of the Gracie system of jiu-jitsu in the Lahaina program. 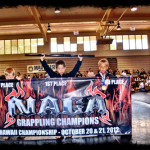 On Oct. 18, Grandi took four of his students — Russell Kapahulehua, Kainoa Kaohelaulii, Michael Bates and Colton Florian — to Honolulu to compete in the 2009 NAGA (North American Grappling Association) Hawaii Grappling Championship at Pearl City High School. Featuring 300 divisions, the contest is noted as the world’s largest grappling tournament circuit. The small Lahaina contingent achieved stunning results, coming home as the top Maui entry in the competition. Grandi’s four students won six first place samurai swords, two silver medals and one bronze medal. The bouts were divided into “gi” (the traditional martial arts uniform)/rank, and “no gi,” by age, and by weight. 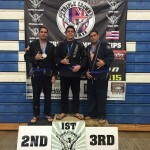 Kaohelaulii won a bronze medal in the 159-pound division, Kapahulehua captured two titles at 225, Bates won two events and placed second in another, and Florian — in celebrating his 16th birthday — took home two first place samurai swords and a silver medal. “I am so proud of our students,” beamed Grandi last week at the club training facility. 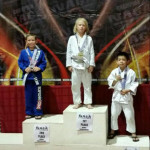 Indeed, young Florian is a prime example of 808 Jiu-Jitsu’s positive influence. A troubled young teenager six months ago, he has immersed himself into the Gracie system taught by Grandi, and the results have spawned a new life for him. He has dedicated himself to training and has also become a mentor to the younger students in Grandi’s charge. According to Colton’s mom, George Florian, the influence and discipline of Gracie Jiu-Jitsu has turned the teenager’s life around. 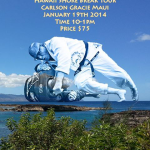 Call 298-8265 for more information on 808 Jiu-Jitsu. Reprinted with permission from Lahaina News. Text for image: From left, Colton Florian, Christian Grandi, Russell Kapahulehua and Kainoa Kaohelaulii returned to Lahaina with several awards.